When asked to review Nelly Cootalot: The Fowl Fleet, I was curious, what was this game! Admittedly and somewhat ashamedly I had not heard of this gem of a game before. What better way to get a feel for the game than to watch the press release. After watching the short video, I was sold. Here was a game with smart visuals, great voice acting and creator Beckett-King dropping jokes which I found a little too hilarious to admit. Suddenly I had gone from curious to extremely excited in two short minutes. I could not wait for my steam download to finish. So what is Nelly Cootalot: The Fowl Fleet? Put simply it is a point and click adventure game. You join Nelly to rescue birds who have been hypnotised by the game’s villain, Baron Widebeard; but why is he doing this, what is his main goal and how will Nelly get the treasure of the seventh sea? Along the way Nelly meets a range of characters, visit many locations and face baffling challenges. Visually Nelly Cootalot: The Fowl Fleet consists of 2D art style plastered with bright colours and a sketch style. Characters are realistic but retain the detail required to give players the sense of depth and complexity. Many of the backgrounds are beautiful and have real detail which not all games go to the bother of doing. The characters within the game are somewhat one dimensional and you can base a characters personality on their looks alone, but I find this adds to the charm. There are many various characters and all are delightful and amusing and most importantly entertaining. The story and plot is entertaining enough, the scripting and smart dialogue keeps the pace going. The plot matches the game in its colourful, not-so-serious manner. Nelly Cootalot: The Fowl Fleet is at times very funny, but as expected with a game based on pirates there are some jokes at which you just want to heckle! But some terrible jokes aside, the scripting is very well written and full of imagination and wonder. The voice acting and soundtrack is where this game shines. Each character has been well casted, especially and most importantly so with Nelly. You don’t want to skip dialogue as the voices are both expressive and emotional. There are some famous voices in there to, with Tom Baker, Toby Longworth, Samantha Béart and Andrew Seacombe joining the cast. The soundtrack is the perfect accompaniment full of beautiful composition and realistic sounds. This game is a point and click game at heart. As with most point and click games this involves clicking on the environment for dialogue, objects and movement options as well some more challenging logic type puzzles. You do have the ability to combines objects found by Nelly to make a third object in order to progress. It nice to see the object combinations are rational and do not involve random combination selections to make bizarre new objects. Whilst it is not always clear how to proceed, there is a hint button which pushes you in at least the right direction. 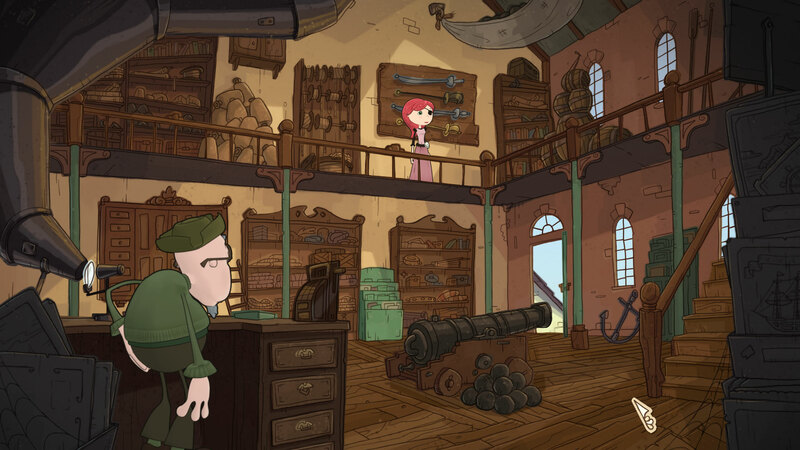 If you are a fan of point and click games, I would definitely recommend Nelly Cootalot. You can feel the love and effort in this game. It is a wonderful example of a point and click mechanic combined with colourful characters and an intriguing plot. You must however need to play this game, with how the creators had in mind; with an open mind, a sense of humour and a promise not to take anything too seriously. Nelly Cootalot: The Fowl Fleet, gets released on the 22nd March 2016. Nelly even has her own twitter! Check it out at @NCootalot.